Sporty style summer leather gloves with breathable back of hand stretch fabric. Summer sports: A great addition to your summer wardrobe, these Crossland motorcycle gloves from Alpinestars feature quality protection alongside a breathable construction. 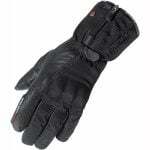 Perfect for riders who want a short, sporty glove without breaking the bank!